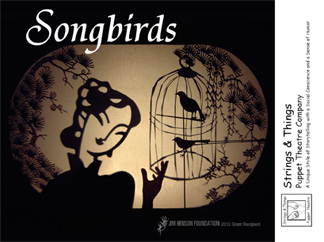 Inspired by traditional Chinese folklore and Puppet Theater, Songbirds is reminiscent of an ancient tale. It is a story about a pair of song birds beloved by a young Chinese girl in a village in China. Under the moonlight of the Mid-Autumn Festival celebration, offerings are made to the moon with brightly lit lanterns and a dramatic Dragon Dance. During the festivities, fireworks cause one of the cherished song birds to escape from its cage leaving its mate and the young girl heartbroken. Through a twist of fate, good fortune comes to all when a secret message hidden inside a traditional moon cake is discovered. Strings & Things Puppet Theatre’s enchanting story of Songbirds, features a charming array of shadow and rod puppets in the telling this heartwarming tale. Your performances look really awesome. Do you do performances at schools? I’d like to talk more. Hello Allison, Yes we do perform for schools, events and festivals. Are you interested in booking us for your next event? Please email me at StringsNthings2@aol.com for more information. Many thank you’s!